When Tabatha Saville first moved to Alice Springs with her family from Fiji, she took to cricket like a duck to water. First introduced to the game at just 9 years old, her dad enthusiastically signed her up for the local cricket school. Back then, there weren’t many girls playing in the area, so she played on the local all-boys team until she was 17 – but this didn’t bother her at all. Cricket was a way for her to meet people in the local community, while playing the sport she loved. Saville soon caught the attention of South Australian officials, and they asked her to try out, sparking a move to the southern state. In forging her own path, Saville exhibited determination, resolve and enormous courage to rise up through the ranks, and she was soon invited to join Cricket Australia’s Talent Squad after making a big impression at the under-18 National Championships. From there, Saville has only gone from strength to strength. Initially deterred by the fast-paced bowling, Saville started out as a fielder, but gaining confidence, she moved to batting. Now, she’s one of the players to watch in the WBBL. Last summer, she struck the match-winning boundary off the final ball of a game against the Melbourne Stars in an unbeaten innings of 28 – winning Player of the Match. 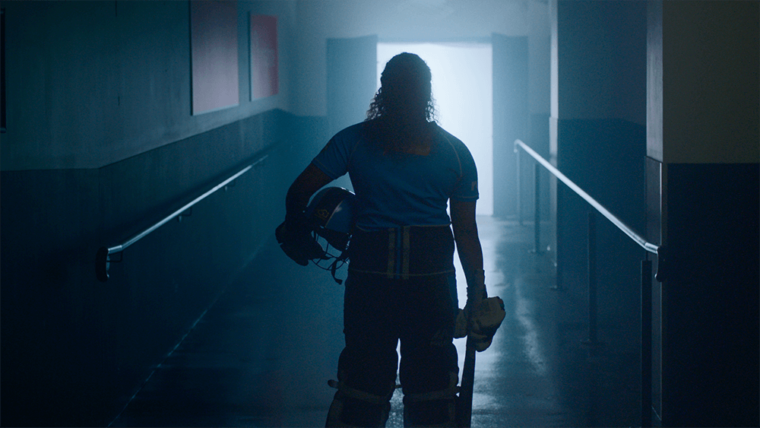 With inspiring players like Saville holding their own on the pitch, women’s cricket is rising in popularity and inspiring more girls to start playing at school. The Women’s Big Bash League is becoming one of the hotly anticipated competitions of the cricket season. And of course, the more support for female athletes, the more funding they can get. Saville is poised to take the Adelaide Strikers to the top with a new team, gained experience and an attitude that no mountain is too high to climb. Moving forward, she’s become a figurehead for change in the sport. Gutsy is calling – Vodafone is proud to be the official broadcast partner for Channel 7’s 2018/2019 Summer of Cricket. Watch Steve Smith, Alex Carey and Gus Worland‘s Gutsy stories.